Only 6 per cent of Canadian businesses are considered digital leaders, according to a study published last October, and the study’s global figures, released today, suggest that’s higher than the global average. The Digital Transformation Index (DTI), a research study conducted by Vanson Bourne last summer and sponsored by Dell Technologies, said Canadian companies are slowly moving in the right direction when it comes to modernization. The index’s Digital Leaders category in Canada, which represents the most digitally mature businesses, grew by 3 per cent since 2016, putting the country one percentage point higher than the global average. The 6 per cent figure isn’t high, but doesn’t tell the entire story either, according to John Byrne, president of Dell EMC North America commercial sales. He pointed to the Digital Adopters group in Canada, which represents the second most digitally savvy businesses, and highlighted the country’s 17 per cent leap in that category since 2016, bringing Canada to 29 per cent. The global average only grew from 14 per cent to 23 per cent in 2018. 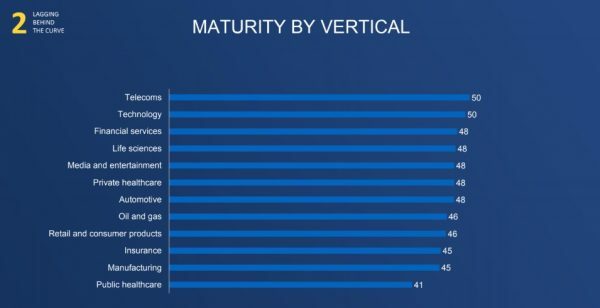 The Dell’s Digital Transformation Index breaks down digital maturity levels based on different verticals. In addition, Byrne said customers are no longer responding to their business challenges with knee-jerk investments in new technologies, but are instead taking a more methodical approach, talking to vendors and channel partners and telling them exactly what business outcomes they expect from modernization. This is best represented by the number of enterprises that mistakenly assumed the introduction of public cloud infrastructures meant the end of on-premises hardware and infrastructure, he added. According to IDC’s Worldwide Quarterly Server Tracker, vendor revenue in the worldwide server market increased by nearly 48 per cent year-over-year to $22.5 billion during the second quarter of 2018. In Canada, server revenue went up by nearly 20 per cent. Since 2016, organizations globally have become increasingly bogged down by data privacy and security concerns, regulation and legislative changes, and information overload, according to the DTI. Among the 13 listed barriers to modernization, those three barriers have made their way to the top half of the list in 2018, with data privacy and security concerns claiming the top spot. Regulation and legislative concerns were ranked ninth in 2016, and has since climbed to the number four spot. Information overload also jumped from 13th to seventh, and data privacy from fifth to first. 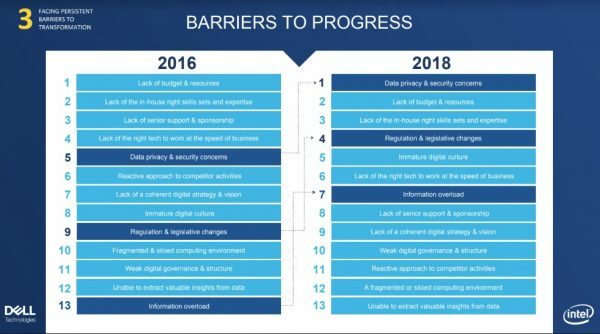 Since 2016, organizations globally have become increasingly bogged down by data privacy and security concerns, regulation and legislative changes, and information overload, according to the Digital Transformation Index. Channel partners play an ever-increasing role in helping customers navigate these challenges, said Byrne, who prior to his time with Dell, used to run his own channel business in London, England. While there are still many resellers who focus on selling boxed products, it’s the partners investing in new service and consulting capabilities which will benefit the most from Dell’s partner programs, said Byrne. He also cited a statistic used by president of global channel, OEM and IoT Joyce Mullen, which is that partners that use multiple Dell products when building a solution are going to see their revenue grow 20-fold compared to partners who only use one. “It’s an extraordinary time for to be in IT, but we have a long way to go,” said Byrne. According to figures from Dell EMC Canada released in October, 36 Canadian medal partners increased their tier status in the year prior, 67 per cent of partners saw a growth in rebates and 52 per cent of partners grew their services business. A few, she added, made the leap from Gold tier to Titanium Black, representing a jump from a $500,000 revenue threshold to $15 million. Additionally, 69 per cent of new accounts in Canada were won in the channel, which is above the market average. The DTI surveyed 4,600 business leaders from mid- to large-size companies across more than 40 countries.